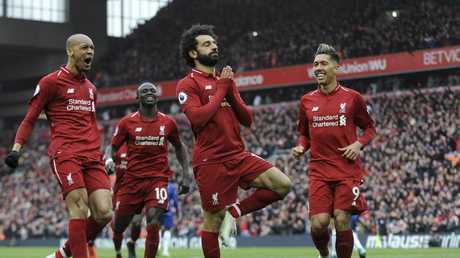 Mohamed Salah blasted in a stunning long-range goal to seal Liverpool's 2-0 win over Chelsea that kept the team top of the Premier League on Sunday. Two minutes after Sadio Mane headed Liverpool into the lead at Anfield, Salah collected Virgil van Dijk's long ball from the back, cut inside off the right wing, and sent a diagonal shot into the top corner from 25 yards (meters) in the 53rd. With City beating Crystal Palace 3-1 earlier Sunday, Liverpool stayed two points clear of the defending champions having played one game more. Liverpool has four games remaining as it looks to win its first league title since 1990, and 19th in total. The Reds' last big chance to win the Premier League came in 2014 but a 2-0 loss to Chelsea at Anfield - sparked by a famous slip from Steven Gerrard that let in Demba Ba to score the first goal - led to City claiming the title. In a twist of fate, City played Palace that day, too. 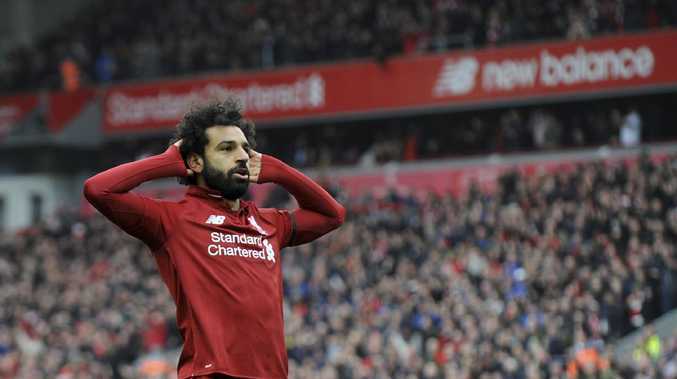 If you're just waking up, Mo Salah has scored one of the goals of the season! In a close first half, Salah and Mane both went close for Liverpool after setting up each other with crosses from out wide. Both forwards are in the hunt for the Golden Boot as the league's top scorer, and they struck at the start of the second half. Jordan Henderson, who later went off injured, chipped the ball from near the byline to the right of the goal and Mane had the simple task to head home at the far post. The Senegal international is only one goal behind Salah and Aguero in the scorers' standings.